Actor and singer Daniela Vega leads the cast of Chilean drama La Jauría (The Pack), which follows a team of investigators tracking a missing woman. The star, showrunner Lucia Puenzo and producers Pablo Larrain and Juan de Dios Larrain discuss making the Spanish-language thriller. The Chilean star and producers of Oscar-winning film Una Mujer Fantástica (A Fantastic Woman) have reunited for a drama that follows the members of a police force that specialises in gender-related crimes. La Jauría (The Pack) features Daniela Vega alongside Antonia Zegers and María Gracia Omegna, who together investigate the strange disappearance of a young woman. 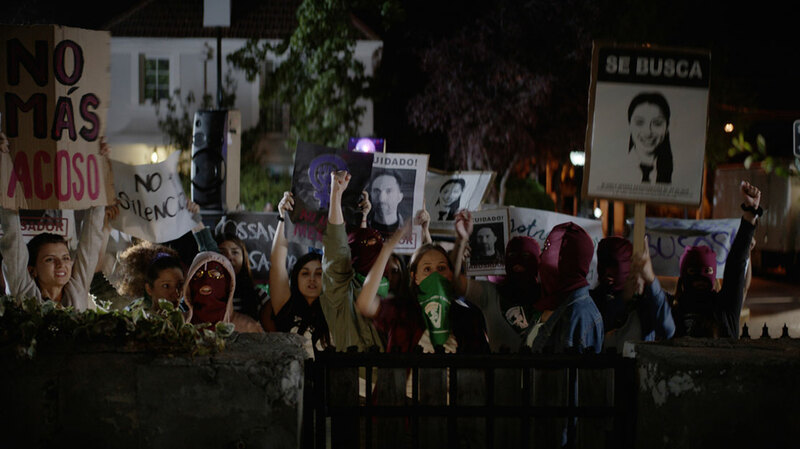 The drama unfolds after Blanca Ibarra, a student and leader of a feminist movement, vanishes during a protest by a group of schoolgirls against a sexually abusive teacher. Hours later, a recording of Blanca being raped by a group of unidentifiable men goes viral, beginning the frantic search for Blanca and those responsible. The investigators – police commissioner Olivia Fernandez (Zegers), corporal Carla Farias (Omegna) and homicide detective Elisa Murillo (Vega) – soon discover that all the suspects belong to a chat group called La Jauría, a front for a gruesome game that involves a teacher, a priest, a psychologist and perhaps even Blanca’s father. Vega was on board the project from the beginning, keen to reunite with brothers Pablo Larrain and Juan de Dios Larraín of producer Fabula following their Oscar triumph for best foreign-language film last year. She had previously filmed Netflix’s upcoming English-language series Tales of the City, but La Jauría marks her first Spanish-language TV drama. “She’s a very strong woman. She’s a leader, so for me it was very interesting to jump into this character,” Vega says of Elisa, noting the difference between her and A Fantastic Woman’s Marina Vidal, a young transgender woman whose life is thrown into turmoil by the death of her boyfriend. “Elisa is a different kind of woman. She’s trying to find bad people. This is not good people against bad people; this is not men against women, nor women against men. This is about the relationship between us as humanity. Despite Fabula’s film background, La Jauría was always destined to become the company’s first television series, Larrain says, adding that the show was inspired by worldwide hits such as HBO’s The Night Of and Danish crime drama Forbrydelsen (The Killing). Behind the camera, Larrain and de Dios Larrain were keen to work with lead director and showrunner Lucia Puenzo (Ignobernable). Having been acquainted with Puenzo for years, the pair say she knows the “rhythm” of TV. When she accepted their offer, the outline of the story had already been laid out and the showrunner teamed up with the writers to continue developing the series. “The plot of the young women was what we were most interested in, because of what has happened in the last few years,” Puenzo says, pointing to global campaigns such as the #MeToo movement. “We wanted to send these young women to the front of the story and see them grow as much as the leading policewomen. Puenzo says she attends all the table readings, where she can watch and listen as the actors read the scripts and begin to understand the dynamics of their characters. Then on set, she tries to organise a quick rehearsal so the actors can prepare to work with the camera, “unless we have sequences with many effects or that are very technical, where sometimes the actor has less freedom because there is already a floor map and a stricter design of the staging,” she says. Filming for the series began in January this year, with most of the action taking place in the Chilean capital, Santiago. Working with her brother Nicolás (Los Invisibles) – the show’s DOP and also director on some episodes – Puenzo imagined La Jauría not as a classic police series but as a personal and subjective journey made by the main characters. Sergio Castro (La Mujer de Barro) and Marialy Rivas (Young & Wild) also direct. “We were interested in showing the very personal lives of each of these protagonists,” she explains. “For example, we used many close-ups contrasted with large general shots. We wanted to have a [filming] language that did not always move in medium shots, as is usual in series and soap operas, but that went to the extremes. Puenzo praises Fabula, which produces the series alongside Kapow for Chilean broadcaster TVN, for affording her the freedom to create the drama as she imagined. “La Jauría is a series that is very well written,” she adds. “It has a lot of texture in its dialogue, a lot of depth in its characters, a lot of complexity.